The perfect place for large group functions and family vacations. Festival country with over 20 wineries in the vicinity. Big Rig sites, log cabins, or camp by the lake. Good location to visit Niagara Falls and the surrounding areas. The park is in a quiet setting as it is situated around many vineyards and farms. Most of the sites in the park are permanently occupied as either a full time residence or as a vacation destination where people leave their trailer or RV on the site. The park has two areas towards the back of the property for the temporary visitors. We had a pull through site that was grass and gravel, flat and plenty long enough for our rig and car. 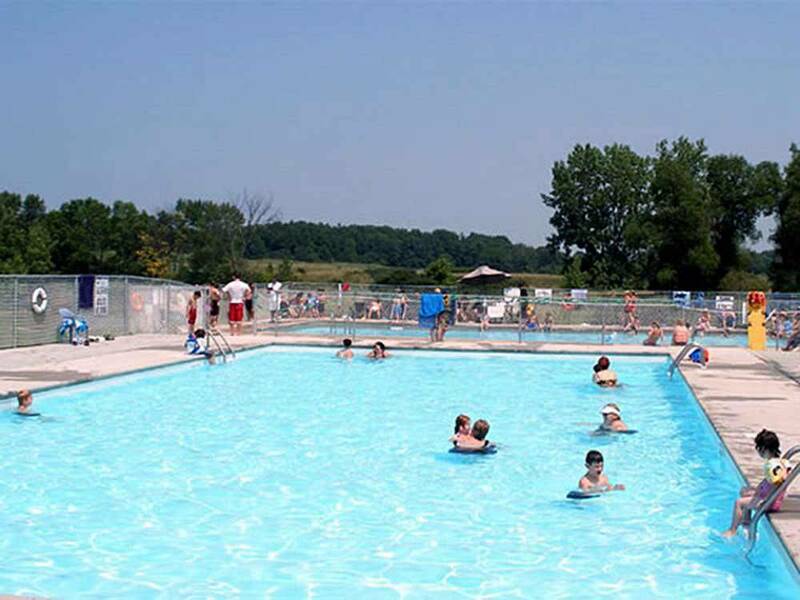 The park has a nice pool area, several showers and bathrooms in various locations around the park, a pavilion for large groups and a laundry room. They advertise wifi but it did not work at all. See our updates, pictures and full reviews at our blog at thegilliamsisland. You are in the middle of a field with No shade. The hookup for sewer is so high it’s difficult to drain. The hydro went out on a daily basis. Can’t go anywhere in case your food spoils. Cigarette butts all over the place. People with water balloons that are broken all over the place. No one picks it up. The only good thing is they pick up the garbage every morning. It was a big disappointment. We even saw lots of dog poop all over. On arrival approx. 4:00 the office was closed. We had to locate our site on our own. The office did t leave any map out for us to follow. Once we found our site it was not what we expected. Not much grass no trees just dirt. If it would have rained we would have been in mud. The wash rooms we were located by were locked, turns out they were shut down for the season. We decided to ask to be moved. The next day we went to the office, i asked to be moved, explained we were not happy with the location and the fact the washroom were closed. They moved us to a nicer location but wed did have to pay the extra. I did make sure that the washroom near the new location were opened. Never did they indicate we needed to pay to use the showers or that we needed loonies. Last issue internet service di d not work at all. Needless to say we will not be going back. While we stayed in a travel trailer, our companions were tenting. Although we had been told prior to booking that the island was quiet and was suggested they stay there, it was quite the opposite. The campground had booked a group of at least 50 people on 5 or 6 sites next to them who brought DJ type sound equipment including large speakers on stands which they played from early afternoon and played past midnight with a mix of un-family like lyrics. Although park management was aware, they failed to enforce their quiet, family park rules. When discussing it with the management they confirmed they knew the group, but there was no apology or other action She was actually very dismissive and was not interested in any feedback. We both ended up leaving a day early and will not to return. Thank you for your recent review of N.E.T Camping Resort. We are glad that you continue to enjoy the Park year after year. Kids Klub will run Monday to Friday during the week for those with children who aren't always here on the Weekends. We appreciate your continued business and with any luck we will not have to endure another painful fire ban this year! The N.E.T is a family oriented place to camp. The Camp staff are friendly and very polite. Very quiet campground with an amazing pool. Bathroom always clean. They have 2 pool. Kids area. You can also enjoy paddle boats on the pond. My kids love to rent the Bikes and ride the campground. Can't wait to book again for this season. Thank you so much for your review of our Campground. We are so pleased that you enjoyed your stay with us. The paddle boats sure are a hit with many both young and old and this year the water levels seem good enough to be able to rent them out. We hope to see you again in the very near future! Thank you for your review of N.E.T Camping Resort, we are very pleased to hear how much you enjoy our park and would love to see you again! What a lovely campground. I would say resort it is so elegant. The staff is very friendly and helpful. My site was large with shade. There are lots of activites - Eucre, bingo. games for the kids etc. I noticed 2 very large pools and will be sure to go later in the year to go swiming. Washrooms were very clean as was the laundry area. Could have done without the video room but kids do indeed like it. all in all a very possitive experience. Thank you for your review of N.E.T Camping Resort. We are very pleased that you enjoyed your stay with us and would love to see you again. Hopefully, next time you visit the Pools & Splash will be open as will the Food Truck! If you like to party and don't enjoy sleep, this is the campground for you! A family in tow or looking to relax in the evenings - go elsewhere... We had planned a 4 night stay but after 2 nights of excessive noise we left and went elsewhere. The first night someone had the bass on their stereo cranked until at least 1 am despite a noise ban for 11 pm. We called their 24 hr. number that no one answers and left two complaints about the noise to no avail. Night 2 there was literally an outdoor concert happening at a neighbouring trailer complete with amps and loud audience. Called before 11 to put it on the map in hopes that noise would be addressed if it continued past 11 - another fail. Concert over around midnight but party lasted ALL NIGHT! Wasted people got really loud and profane at around 6 am. This campground is nice looking and has nice amenities but the management is very poor which is unfortunate. They have all these rules that made us feel that it would be family appropriate and comfortable but they don't enforce anything. I don't know if they're afraid of the party crew, they value their money more because they're seasonal or if it's because their sites are far enough away from the main office that they don't care. I just don't know why they'd put over nighters there - especially older people or those who they know have young kids. I didn't even get into the older men drinking beer around the kids splash pad and the $1 per 5 min showers... No thanks, will spend our money somewhere else and will not be returning. We are sorry to hear that your stay was not what you had hoped for, we do try our best to enforce the 11PM noise restrictions and this generally has not been a problem in the past. We were not aware of any loud noise or equipment being used to have a loud and boisterous party and if we were it would have been shut down without delay. We are known as one of the quieter private parks within the Niagara Region and are also known for our amazing family activities and events. We are a family park and it is unfortunate that someone inconsiderate ruined that experience for you. As we are rated a 9/10 star Good Sam Park year after year, we would like the opportunity to host you again in the future for an enjoyable stay! Overall it was just OK. We stayed in an area where there are both tenting spaces and water/electric spaces. There was one porta-potty for the entire area and it was cleaned only once in the two weeks we were there! It was so disgusting that by the time we left you could not even open the door without swarms of flies coming out after you. They seemed to be quite tight with money - charging for showers and making sure you wore a wristband to show you had paid to be in the park. I think the cost of the wristbands was likely more than the amount they would be losing by someone trying to sneak in the park to swim! The park is gated and during the hours the store is open they will open the gate when you hold up your wristband. We discovered when we came back late one night that we could not get in because the store was closed. Finally a seasonal camper let us in with his pass card. We asked the next day and got a pass card for a $20.00 refundable deposit. It would have been nice to know about this in the beginning - so if you are going to be out later than 9 pm make sure you get one. On the positive side - the park and pool area was clean. The garbage was collected daily. The staff at the reception seemed friendly. The pools were nice and the deeper one had a lifeguard on duty. The pool hours were 10 am - 8 pm. They did have activities on the weekends that all took place at the rec hall. Some of the activities had to be signed up for at the store - this was not always clear so make sure you ask if you want to participate in something. Overall I do not think we would camp there again. As I said initially it was just OK. There are other campgrounds in the area that offer a lot more that I would go to instead of NET. Thank you for your review of N.E.T Camping Resort. Your feedback is very much appreciated and will be looked into. Our Portable Toilets are contacted by a local company and are ALWAYS cleaned at LEAST once per week (often times more if our attendance is high). In the future, please feel free to inform the Office if they are not up to standard as we would have called in the contracted company to clean them immediately. We are happy to announce that our gated system will be changing to a more "user friendly" system this Summer, please keep in mind it will still be gated as this is for the safety and security of all of our patrons, in fact many consider the gates to be one feature they like the most as it makes them feel more secure. Our wristband system is one that is used in Resorts worldwide as it helps control who is in the park and when they are due to check out, we welcome ideas of other ways to monitor this if you have any suggestions :) We do hope you will give us another try in the future to show you how great the park really is! Sewage smell on and off at back half of the campground depending on wind direction. Pond hidden by evergreens may be the source. Bad smell in pool washrooms. Requested a refund and we're refused. Arcade room with no air conditioning or fans. Some type of event held in overflow camping area on July 23. Tons of teenagers/young adults arrived. Lots of noise. This event was not listed on the calender. We stayed elsewhere for the night. Not a good family campground. We are sorry to hear that your stay wasn't what you had hoped for. We pride ourselves in being a 9/10 star Good Sam rated & inspected park year after year. Since we do have Farmers fields all around the perimeter of the resort it is possible the smell you refer to is that of a farming nature, our washrooms are inspected and cleaned continuously throughout the day however if you should ever encounter a dirty washroom we encourage you to contact the Office so that it can be taken care of immediately. Our Arcade and Pavilion do have fans and roll up doors which generally keep them cool as well. In terms of the "overflow" camping, we think you are referring to the tenting area, had any complaints about noise been reported this would have been dealt with by staff, as we do enforce the 11PM quiet time. We would like the opportunity for you to visit again so we can prove what a great family park we are! We booked two sights here for Labour Day weekend. The park is huge and laid out fairly well. It seems that a lot of the weekend sites are mixed among the seasonal sites (which there are a lot of). The area we stayed was at the very back of the park. It was a pull through site and extremely large, even with our 37' trailer and truck there was still lots of length. My only complaint was the lack of trees and grass in the area we were in, it was a little redneck. The pools were very cloudy and dirty, but this was the last weekend they were open so I'm guessing that they were letting them go a little. The overall value was great and we had a great time and will be returning in 2016. Thank you for your review of N.E.T Camping Resort. Our park is well known for our large sites, abundance of activities and great pool. The back of the park is a newer area and we hope that over time, the tree's that were planted will grow nice and big to create some shade to match the front part of the park. We hope to see you back again!